If you’ve taken a great photo, there are no doubt two things you wish you could do with it. First, you wish you could see it much bigger than how it appears on your computer screen. Second, you wish you could share your stunning creation with as many other people as possible. Cue a digital projector. Modern projectors can deliver your photographs at sizes of 100in or more with a quality level that would have been unthinkable even just a couple of years ago – despite the fact that projector prices have plummeted over the same period. There’s just one problem: when buying a digital projector, picking the right one is a minefield. For instance, there are numerous different types of projection technology, each with its own pros and cons. LCD projectors tend to excel in brightness and provide more natural colours in dark areas, but lack contrast and can exhibit visible pixel structure. DLP projectors often deliver better contrast and less visible pixelation, but aren’t as bright and can suffer with flashing colour stripes. Sony’s SXRD and JVC’s D-ILA systems both deliver natural, contrast-rich images, but they’re relatively expensive and struggle for brightness. You also need to consider resolution. Today’s digital cameras routinely boast enormous numbers of pixels, yet many affordable projectors only support native resolutions of 1,280×768 pixels – or even fewer. So aim for one with a ‘full HD’ resolution of 1.920×1.080 pixels, the highest resolution you can get without splurging £6,000 on a new Sony ‘Ultra HD’ projector. A critical part of choosing any projector is the relationship between contrast and brightness. Often projectors push either brightness or contrast, rather than striving for a balance. Yet a balanced approach is what’s needed to unlock the full quality of your photographs, as brightness alone can leave your shots looking washed out. 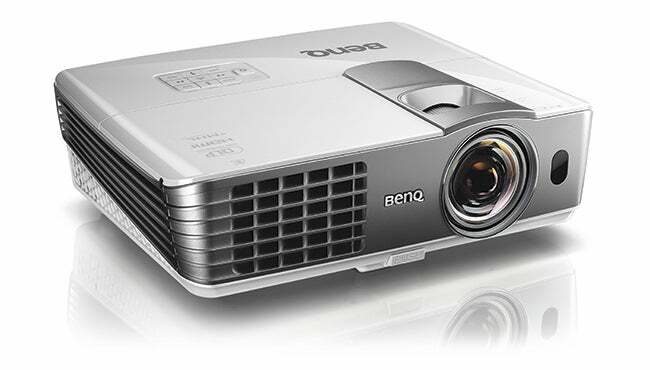 It doesn’t help that projector makers commonly overstate brightness and contrast specifications, but as a rule, unless you can easily black out your viewing room, look for brightness claims of between 2,000 and 3,200 Lumens, and contrast of 10,000:1 or more. A good contrast/brightness balance usually helps deliver natural colours, but it’s worth looking for projectors that support the sRGB colour standard used by most digital cameras. Finally, there are set-up practicalities to consider. Make sure that your projector has the connections you want, be it a USB port for playback direct from camera or USB storage devices, a D-Sub PC port for playing slideshows from a computer, or (preferably) an HDMI port for direct connections between your camera and/or computer. If you’re going to be using the projector in lots of different locations, look for a portable design and plenty of image size/placement flexibility. For instance, consider whether you want a short or long-throw lens, and look for plenty of optical zoom (never use digital zoom systems, as these ruin picture quality). Also ensure that the projector provides either keystone correction or, even better, optical image shifting to help project the pictures without the edges appearing angled. When choosing a projector, look for models with the connections (USB, PC VGA and/or HDMI) that suit the way you store your digital photographs. Also look for convenient set-up features like plenty of optical zoom and image shifting to help get the pictures in the right place on a screen or wall – especially if you’re likely to be using a projector in multiple venues. When it comes to a projector’s innards, look for models that offer a good balance between brightness and contrast (excessive brightness can make colours look unnatural), and provide plenty of colour adjustment including, ideally, an sRGB picture preset. On-projector buttons are handy in case you lose or forget the remote. These are often accessed through the top panels of small projectors. These let out the heat produced by the projector’s lamp, but can also leak light. Remember that different lenses can deliver very different image throw distances.